Draft: 2012, Washington Nationals, 2nd rd. Full name is Anthony John Renda. Married his wife, Samantha, on 12/12/15...They have a son, Ryan (born 12/26/17). Signed by Fred Costello (Nationals). Played 3 seasons at the University of California at Berkeley (2010-12), where his 244 career hits ranked 6th on the school's all-time list when he was drafted. Named to the All-Pac-12 First Team in 2012...As a sophomore in 2011, was named Pac-10 Player of the Year after leading the conference in hits...In 2010, was a Collegiate Baseball Freshman All-American. Graduated in 2009 from Serra High School in San Mateo, CA with a school-record 152 hits...As a senior, led his team to the Central Coast sectional championship. Also in 2009, was a high school All-American and was the Player of the Year in San Mateo County and the West Catholic Athletic Conference. Made his Red Sox organizational debut after signing with the club as a minor league free agent on 4/29...Was released by ARI on 3/21. Appeared in 1 game with BOS, 42 with Triple-A Pawtucket, and 26 with Double-A Portland. Began the season with Portland and hit .371 with a 1.013 OPS for the Sea Dogs. Batted .479 (23-for-48) during an 11-game hit streak for Portland from 5/6-15...Recorded multiple hits in 5 straight games from 5/12-15 (13-for-23, .565 AVG). Placed on the disabled list on 5/27 with a left hand fracture...Reinstated on 7/4. Transferred to Pawtucket on 7/12 and hit safely in each of his 11 games with the PawSox from 7/12-24, going 22-for-49 (.449)...Recorded multiple hits in 7 straight games from 7/15-22. Selected to the ML roster on 8/4 when Ian Kinsler was placed on the 10-day disabled list. Made his Red Sox debut on 8/5 vs. NYY...Entered in the 10th inning as a pinch runner at 2B, replacing Sandy León...Scored the winning run on an Andrew Benintendi walk-off single in the Sox' 5-4, come-from-behind victory. Optioned to Pawtucket on 8/8 and spent the remainder of the season with the PawSox. Split the season between CIN's Triple-A Louisville and ARI's Triple-A Reno. Played in only 59 games due to 3 stints on disabled lists...Was out from 4/19-26 (right hamstring strain) and 5/30-6/6 (right wrist fracture), and again with a right wrist bone spur from 7/17 through the end of the season. Acquired by ARI on 7/3 in exchange for cash considerations... Played in 8 games for Reno before suffering his season-ending injury. At Class AA Pensacola and Class AAA Louisville combined to hit .311, second-highest average by any Reds minor league batter (Hernan Iribarren, .327)...was 1 of 12 Reds players to make his Major League debut...made 32 apps during 2 stints with the Reds, including 13 starts at 4 positions (9g/5gs at 2B, 1g/1gs at 3B, 4g/3gs in LF, 4g/4gs in RF)...originally was promoted on 8/2 with Scott Schebler to fill the roster spots vacated by Jay Bruce (traded to NYM) and Jose Peraza (optioned to Louisville)...for the Reds from 8/2-8/26 made 16 apps and 5 starts...was returned to Louisville on 8/27, when C Raffy Lopez was promoted following Tucker Barnhart's injury...rejoined the club after rosters expanded in September and made 16 more apps, including 8 starts...on 8/2 vs StL made his Major League debut, pinch hit and reached base on a sac bunt / E3 that 3 days later after review was changed to a single for his first career hit...in the top of the seventh inning of the 7-3 win on 8/7 at Pit produced his first career RBI with a pinch-hit single off Jared Hughes that extended the Reds' lead to 5-2...on 9/28 at StL produced his only 2-hit game...for Pensacola and Louisville played 2B (23g), 3B (17g) and OF (54g)...from 7/19-7/28 was on Louisville's disabled list with a sprained right wrist...on 12/5 cleared waivers and was outrighted to Louisville...on 12/9 was invited to 2017 Major League spring training camp. April 14, 2019 Pawtucket Red Sox placed 2B Tony Renda on the 7-day injured list retroactive to April 11, 2019. Right shoulder strain. November 28, 2018 Boston Red Sox signed free agent 2B Tony Renda to a minor league contract and invited him to spring training. November 28, 2018 2B Tony Renda assigned to Pawtucket Red Sox. November 2, 2018 2B Tony Renda elected free agency. November 1, 2018 Boston Red Sox sent 2B Tony Renda outright to Pawtucket Red Sox. October 1, 2018 Boston Red Sox recalled 2B Tony Renda from Pawtucket Red Sox. August 8, 2018 Boston Red Sox optioned 2B Tony Renda to Pawtucket Red Sox. 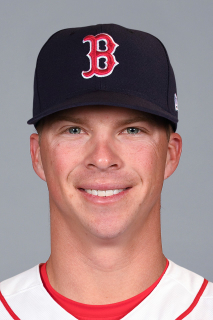 August 4, 2018 Boston Red Sox selected the contract of Tony Renda from Pawtucket Red Sox. July 12, 2018 2B Tony Renda assigned to Pawtucket Red Sox from Portland Sea Dogs. July 5, 2018 2B Tony Renda assigned to Pawtucket Red Sox. July 4, 2018 Portland Sea Dogs activated 2B Tony Renda from the 7-day disabled list. May 30, 2018 Portland Sea Dogs placed 2B Tony Renda on the 7-day disabled list. April 30, 2018 Boston Red Sox signed free agent 3B Tony Renda to a minor league contract. April 30, 2018 2B Tony Renda assigned to Portland Sea Dogs. February 21, 2018 3B Tony Renda assigned to Arizona Diamondbacks. September 29, 2017 Reno Aces activated 3B Tony Renda from the 7-day disabled list. July 18, 2017 Reno Aces placed 3B Tony Renda on the 7-day disabled list. Right wrist injury. July 4, 2017 Reno Aces activated 2B Tony Renda. July 3, 2017 Louisville Bats traded 2B Tony Renda to Reno Aces. June 7, 2017 Louisville Bats activated 2B Tony Renda from the 7-day disabled list. June 1, 2017 Louisville Bats placed 2B Tony Renda on the 7-day disabled list. April 27, 2017 Louisville Bats activated 2B Tony Renda from the 7-day disabled list. April 20, 2017 Louisville Bats placed 2B Tony Renda on the 7-day disabled list. December 9, 2016 Cincinnati Reds invited non-roster 2B Tony Renda to spring training. December 5, 2016 Cincinnati Reds sent 2B Tony Renda outright to Louisville Bats. September 6, 2016 Cincinnati Reds recalled 2B Tony Renda from Louisville Bats. August 27, 2016 Cincinnati Reds optioned 2B Tony Renda to Louisville Bats. August 2, 2016 Cincinnati Reds selected the contract of Tony Renda from Louisville Bats. July 29, 2016 Louisville Bats activated 2B Tony Renda from the 7-day disabled list. July 19, 2016 Louisville Bats placed 2B Tony Renda on the 7-day disabled list. June 22, 2016 2B Tony Renda assigned to Louisville Bats from Pensacola Blue Wahoos. March 26, 2016 2B Tony Renda assigned to Cincinnati Reds. June 11, 2015 New York Yankees traded RHP David Carpenter to Washington Nationals for 2B Tony Renda. June 11, 2015 2B Tony Renda assigned to Trenton Thunder. June 11, 2015 Trenton Thunder activated 2B Tony Renda. April 7, 2015 2B Tony Renda assigned to Harrisburg Senators from Potomac Nationals. March 21, 2015 2B Tony Renda assigned to Washington Nationals. May 12, 2014 Potomac Nationals activated 2B Tony Renda from the 7-day disabled list. April 13, 2014 Potomac Nationals placed 2B Tony Renda on the 7-day disabled list. March 31, 2014 2B Tony Renda assigned to Potomac Nationals from Hagerstown Suns. March 8, 2014 IF Tony Renda assigned to Washington Nationals. April 2, 2013 2B Tony Renda assigned to Hagerstown Suns from Auburn Doubledays. June 15, 2012 Tony Renda assigned to Auburn Doubledays. June 12, 2012 Washington Nationals signed 2B Tony Renda.